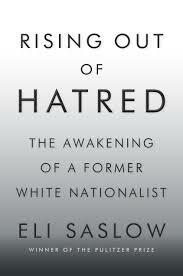 Rising Out of Hatred by Eli Saslow was a good book about Derek Black, godson of David Duke and son of Don Black, founder of the site Stormfront, the largest racist community on the Internet and one that Derek contributed to starting when he a youth and was expected to one day take the leadership of. The book is subtitled The Awakening of a Former White Nationalist and details the gradual transformation of Derek that began in his first year as a student at New College of Florida, a liberal four-year university. Derek arrived on campus with his views about and against blacks, Jews, and other minorities unknown to to his classmates and for a time, lived a sort of double life, spewing racism online and via a radio show while also befriending a diverse group of people. After having his beliefs and activities outed on campus while studying in Europe for a semester, Derek returned and was largely ostracized at New College, but then reached out to by some, invited by an Orthodox Jew classmate to attend his weekly Shabbat dinner, and developing a close friendship with a woman who helped change his views, through both her challenging his beliefs and he seeing how they made her feel. Derek prior to and when he first arrived at New College talked and wrote a great deal about the the concept of anti-privilege for whites, how they under attack and fighting for basic rights as a minority group. He gradually went from being a White Supremacist, who felt whites better than others, to a White Nationalist, who felt races should be kept separate and whites needed protection, to someone who both abandoned his prior notion of whites under attack and saw the damage forcing people apart would cause. Derek after graduation from New College and prior to starting graduate school in Michigan wrote a letter to the Southern Poverty Law Center repudiating his prior views, leading to his family basically disowning him. Additionally, he wrote several opinion pieces for the New York Times, warning about the dangers Trump bringing in and the story that Saslow tells of Black is a really profound one well told. 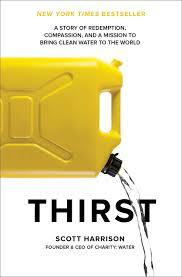 Thirst by Scott Harrison was from the founder of charity: water and the book jacket notes that the nonprofit over the past eleven years has funded some 28,000 water projects via contributions from over a million donors. The book notes how when Harrison four years-old, his mother was exposed to carbon monoxide poisoning from their house, impacting greatly her immune system for decades to follow. It was fascinating reading on how debilitating her illness was, how easily it would get triggered, and the lengths people would have to go to in order to spend time with her as she had to be kept away from toxins. Also compelling was reading on the effort Harrison's father put in to try to help his wife improve. Harrison details how he in his early 20's worked as a New York City nightclub promoter, living a fairly wild lifestyle, and then reached a point of reconnecting with the religious faith his parents tried to instill in him and wanting to start anew. He landed a year-long volunteer gig as a photographer with Mercy Ships, an organization that that worked in Africa providing free health care, particularly in the area of dental work and surgeries on the eyes or to repair facial abnormalities like clefts or disfiguring palates. During Harrison's time there, he was exposed to the problem that is a lack to clean water, with people he met educating him about how many of the problems faced by people in Africa can be traced back to this shortage. After his time on the Mercy Ships boat ended, he returned to New York and starting hosting fundraisers for the organization and then started a new charity focused on clean water. The portion of the book about charity: water covers things like the three pillars of the group... the 100% donation model, with organizational overhead paid by a fairly small group of donors known as The Well so that every dollar from other charitable contributions goes directly to water projects, how donations made are tied to specific projects and people told what they're giving to, and that the branding around donations is designed to inspire people rather than try to make them feel guilty. Also detailed is the story of Rachel Beckwith, someone who for her ninth birthday asked her friends to donate to clean water rather than getting her presents and shortly after died in a car accident. Her pastor in Seattle asked Harrison to reopen her giving campaign, with it first getting donations through the church congregation, and then complete strangers as the story went national, leading to the campaign raising in Rachel's name over $1.2M from some 31,000 donations. It's a good and inspiring book and noted at the end, along with information about The Spring, charity: water's monthly giving program, is mention of using the code 'together' from the website to learn more. 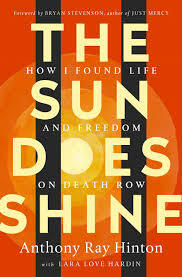 The Sun Does Shine by Anthony Ray Hinton was a great book subtitled How I Found Life and Freedom on Death Row, with Hinton released after spending nearly thirty years in prison for a crime he didn't commit. Hinton in 1985 was clocked in at work while a robbery committed elsewhere, and arrested after someone who had an ax to grind implicated him in that crime. Prosecutors then decided that the robbery similar to two unsolved murders and charged him with those crimes as well, with his state-appointed attorney providing scant defense, after complaining to Hinton about how little money he received from the state of Alabama for that representation. What comes through from the the story of Hinton's time on Death Row was how there's humanity possible in anything, how you respond to people is a choice. Fifty-four people were executed in his jail while he there and Hinton very much helped his fellow inmates, through the book club he formed as well as the simple act of acknowledging them, either during dark nights or by banging on the bars during executions, so someone would know they not alone, regardless of guilt or innocence. The forward of the book was written by Bryan Stevenson, a lawyer who represents Death Row inmates and fights to abolish the death penalty, with it noted in the book both that we don't have the right to decide who should die, and people can be wrongly convicted, often due to poor representation as a result of not having money available for their defense, just like in Hinton's case. Hinton cites at the end that one out of every ten on Death Row are innocent, and Stevenson noted in a 2005 newspaper editorial that since 1975, there have been thirty-four executions and seven exonerations of Death Row prisoners, close to a one in five rate. Stevenson and Hinton met in 1999, with the state courts agreeing with the arguments of prosecutors and continually denying all appeals made on Hinton's behalf. Stevenson and Hinton then petitioned the U.S. Supreme Court and asked them to review whether adequate defense representation had been provided. The Court unanimously ruled in 2014 that that it had not been adequate and sent the case back to lower courts for review, with those courts agreeing with the Supreme Court and saying the case would have to be retried in Alabama. After first accusing Stevenson of stealing evidence that couldn't be found, the state declined to prosecute and dropping all charges, leading to Hinton's April 2015 release from prison. The book is about a lot things, the horrible justice system in Alabama, the work of Bryan Stevenson, Hinton's attitude towards life and helping others, the support he received from Stevenson and his childhood friend who came to see him at virtually every visiting day over the thirty years, and the notion that people "shouldn't get used to injustice." Just as much as these other things, though, the book about this idea of whether the courts should be able to sentence people to death, with the closing of the book that "the death penalty is broken, and you are either part of the death squad or banging on the bars. Choose." 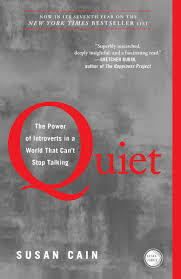 Quiet by Susan Cain was a solid book subtitled The Power of Introverts in a World That Can't Stop Talking. Cain covers how extroverts are held up as the way someone supposed to be, but that gives short shrift to what introverts, as a sizable portion of the population, contribute and the skills an introvert posses can be ones that an extrovert might likely not have, ones around listening, not being rattled, and being able to focus. Its noted in the book how introverts can speak publicly, and will typically be most successful doing so on things that are important to them, and that we shouldn't build our workplaces and homes simply around extroverts. For an extroverted parent of an introverted child, care should be taken to both understand that the child different than themselves and to help in planning for interactions and big social encounters. The book is a bit slow at times, but has interesting ideas to it.